This interesting surname derives from "Ad", a pet form of the Hebrew male given name Adam, meaning "red earth", with reference to the substance from which the first man was formed, plus the Olde English pre 7th Century diminutive suffix "-kin". The "d" was dialectally changed to "t" in certain areas, and the final "s" indicates the patronymic form ("son of Atkin"). Adekin filius Turst appears in the 1191 Pipe Rolls of Norfolk. The surname was first recorded in the early half of the 14th Century (see below), and one John Adekynes is noted in the Subsidy Rolls of Warwickshire (1332). The first Scottish recording is of one John Akyne, who in 1405, had his ships and goods seized by the English. 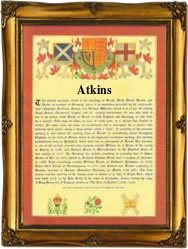 In the modern idiom the surname has many variant spellings including Adkins, Adkinson, Atkyns and Adkisson. Henry Atkins, M.D. (1558 - 1635), was president of the College of Physicians six times between 1607 and 1625, and attended Henry, Prince of Wales, in his last illness (1612). One of the earliest settlers in the New World was Robert Atkins, aged 23 yrs., who departed from London aboard the "Alexander", bound for the Barbadoes in May 1635. The first recorded spelling of the family name is shown to be that of William Atkyns, which was dated 1327, in the "Subsidy Rolls of Worcestershire", during the reign of King Edward 11, known as "Edward of Caernafon", 1307 - 1327. Surnames became necessary when governments introduced personal taxation. In England this was known as Poll Tax. Throughout the centuries, surnames in every country have continued to "develop" often leading to astonishing variants of the original spelling.